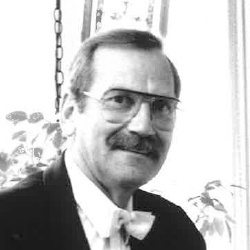 Donald Busarow graduated from Concordia College, River Forest, IL, and continued his organ and compositional studies at the University of Michigan, The Cleveland Institute of Music (M.Mus. ), and Michigan State University (Ph.D.). He served as University Organist, Director of Chapel Music, and Professor of Music at Wittenberg University, Springfield, OH, teaching theory, composition, organ, and church music. He was appointed director of the Wittenberg University Choir in 1982. He also was a Visiting Professor of Church Music at Trinity Lutheran Seminary in Columbus beginning in 1989. In 1996, Busarow was awarded an Honorary Doctorate of Letters degree from Concordia University River Forest. He won first prize at the International Horn Society Composition Competition in 1980. Busarow passed away on October 24th, 2011.